We’re back with another blast from the past from Kikaider 01! But this time we’re taking a look at a massive release from this series. The Toei Hero Net Exclusive S.H. Figuarts Hakaider Squad! The Hakaider Squad was created by Gill Hakaider in the opening moments of Kikaider 01 in order to finish taking over the world. A formidable team these beings were created from the brains of deceased DARK scientists. Each of the Hakaider Squad members also specializes in their own form of combat thanks to their personalized weapons. Red Hakaider wields the Missile Bowgun to take enemies down from a distance. Blue Hakaider makes use of his deadly Magnetic Whip to strangle foes. And lastly the Silver Hakaider has both long & short versions of his powerful Electron Staff! 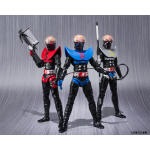 The Hakaider Squad is an amazing trio of figures that finally gives your Hakaider &or Gill Hakaider an army to command. These 5 uses of the mold together make a truly amazing display. We’ve got over 40 images of the S.H. Figuarts Hakaider Squad after the jump, and an in depth breakdown of the figures & their accessories too. Click “Discuss on the TokuNation Forums” at the bottom of this post to see it all! After recently being teased in a Bandai Tamashii Nations blog entry, full release details for the S.H. Figuarts Hakaider Squad have been revealed! Made up of Red Hakaider, Blue Hakaider and Silver Hakaider, these three act as Gill Hakaider’s henchmen in the opening section of Kikaider 01. As many expected the figures will be coming as part of a 3-pack, however the set will also be a ToeiHero.net exclusive. Each figure will come with their own unique weapon, along with presumably an array of additional hands. Costing a total of 16,200 yen, preorders will be open until the 30th April with the set shipping out to collectors in September.